eve been hearing a lot in the news lately about the importance of early learning experiences, including exposing young children to books and readingand its all true. A child who has been read to when young is more likely to be a good reader herself and to be successful in school and in life. And there is nothing cozier than sharing a favorite story: cuddling up together and studying the pictures in a delightful childrens book. Books also provide important lessons. And a story doesnt need to be didactic, to have an explicitly spelled out moral, to get its point across. Even young children can relate the allegorical experiences in a story to their own situations, especially if they have learned to discuss stories from an early age. Consider some of our favorite folktales. Little kids know that Goldilocks is taking some pretty major liberties when she enters the bears house, and the bears dont have to call in the cops and have Goldie arrested for the lesson to sink in. And Little Red Riding Hood? Well, she didnt mind her mama, who told her to stay out of the woods, so its only to be expected that shed have to face that wolf. As a childrens librarian, Im always on the lookout for well-written picture books of all types, and as a large woman, I appreciate the ones with size-positive attitudes. A new book I especially like is Sunflower Sal, written by Janet Anderson and illustrated by Elizabeth Johns. Sal is a big girl whose size is an advantage in her life on a farm. She does get frustrated when trying to quilther "needles wont thread and her squares wont square"but Sal is creative. She grows sunflowers that turn the whole farm into a visual quilt. The books vibrant paintings bring her happy triumph to life. Lots of stories boast illustrations of exuberant women of size. Harder to find are nice round children. A charmer with both is Hotter Than a Hot Dog!, written by Stephanie Calmenson and illustrated by Elivia. A young girl and her grandmother escape the heat with a trip to the beach and have a magical day cavorting unself-consciously in their bathing suits. In Mrs. Meyer the Bird, written and illustrated by Wolf Erlbruch, the large Mrs. Meyer is a champion worrier. When she rescues a baby bird and raises him in her kitchen, her talent for worrying finds a worthy object. The story takes a surreal turn when Mrs. Meyer finds a way to teach her bird to flyand teach herself to leave her worries behind. Many of us can remember the taunting of rude classmates. In Fat, Fat Rose Marie, written and illustrated by Lisa Passen, Rose Marie is the new girl in class. She quickly gets to know the red-haired and freckled narrator, who proves to be a friend of rare fun and imagination. Nasty Genevieve, who leads the "Fat, fat Rose Marie" taunting, does her best to ruin this friendship, but gets her comeuppance with an ice cream cone in the face (a waste of good ice cream, true, but so satisfying!). This book, although not subtle, is a nice contrast to Dont Call Me Fatso by Barbara Philips, with its predictable story about an eight-year-old who overcomes the teasing about being fat by going on a diet and losing weight. I come across references to dieting more often than I would like in picture books. Like all kids, those who are picture-book age dont need diet-think. Even though A Piece of Cake by Jill Murphy ends with Mama Elephant agreeing that elephants are meant to be fat, the whole story turns on the diet and exercise routine she has earlier forced upon the entire family. 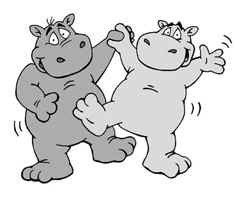 Likewise, What Should a Hippo Wear? by Jane Sutton ends with Bertha being loved for her own round self, but not until she laments that she hasnt time to go on a diet and endures a humiliating scene at the Jungle Dress Shop (which falsely advertises "We specialize in large sizes"). 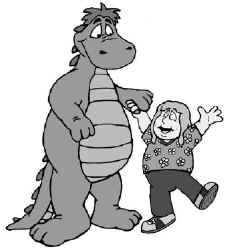 Of course, being fat isnt the only thing kids get teased about, and stories with strong little heroines and heroes who keep their self-esteem in spite of all efforts to deprive them of it are almost always inspiring. For instance, in The Blushful Hippopotamus by Chris Raschka, young Roosevelt turns red whenever his sister teases him about the natural mistakes a very young hippo can make. But Roosevelt is lucky to have a terrific best friend who shows him that hes not blushful: hes hopeful, mindful, thoughtful, and wonderful. With each new word Roosevelt grows bigger and prouder, and his mean sister shrinks away into the background. 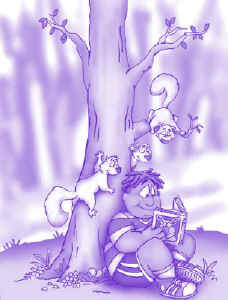 The Blushful Hippopotamus is one of many books whose illustrations use animals to depict people. If youve ever browsed the childrens section of a library or bookstore, you have doubtless noticed this phenomenon. It brings an element of fantasy and imaginative playfulness to the story, and animal characters carry a universality that transcends considerations of race or age. Of course, animals have certain characteristics built in: for instance, elephants and hippopotamuses always represent a physically large character. How an author and illustrator use that largeness may teach subtle (or sometimes not-so-subtle) lessons about how size plays out in real life. George and Martha by James Marshall says nothing overt about size, but the ease of these two hippos, with their overflowing roundness, is always endearing. In one story, Martha loves to look at herself in the mirror (what young child would not identify with this?) with an innocent enjoyment that speaks of healthy self-esteem. Marshall wrote a whole series of George and Martha stories, including George and Martha: Tons of Fun and George and Martha: Round and Round. Helpful Betty, another likable hippo character, stars in two books written by Michaela Morgan and illustrated by Moira Kemp: Helpful Betty to the Rescue and Helpful Betty Solves a Mystery. Young Betty wreaks hilarious havoc in her attempts to be helpful, all the while singing songs like, "Fa-la-la, fiddle-dee-de, here comes graceful little me. Leaping and flying as fast as a flea, light as a leaf floating free." She truly sees herself as light and graceful. What a role model! 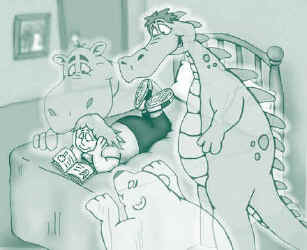 The Bigness Contest, written by Florence Parry Heide and illustrated by Victoria Chess, features a hippo named Beasley. Beasley never succeeds in winning the blue ribbon he so desperately wants (hes afraid hell never be good at anything) until he enters a bigness contest, but even that doesnt turn out as he expects. This story should appeal to all of us who have given up trying to hide our size and have come to appreciate ourselves as we are. Sharing a book with a child allows you many opportunities to talk about your values. As you and the child react to the story, it is easy to share how it makes you feel. Stories allow children to experience situations and emotions in a safe and protected way, preparing them for that big world outside our doors. The standard picture book is only thirty-two pages. Most have a brief text, but those few words can hold life and death and everything in between. When choosing books to share with a child, I suggest you grab an armful and read them through before you take them home. With library books, the price is right: you can read all you want for free, so experiment widely. SHARON HENEGAR, M.L.S., has been a librarian for more than twenty years. She and her husband, who is a professional storyteller, live in San Mateo, California. Henegar currently works at a private elementary school where, in addition to her duties as a librarian, she participates in such events as Silly Hat Day. Sunflower Sal by Janet Anderson; illustrated by Elizabeth Johns (Albert Whitman & Co, 1997). Hotter Than a Hot Dog! by Stephanie Calmenson; illustrated by Elivia (Little, Brown & Co., 1994). Mrs. Meyer the Bird by Wolf Erlbruch (Orchard, 1997). Fat, Fat Rose Marie by Lisa Passen (Henry Holt, 1991). The Blushful Hippopotamus by Chris Raschka (Orchard, 1996). George and Martha by James Marshall (Houghton Mifflin, 1972). Helpful Betty to the Rescue and Helpful Betty Solves a Mystery by Michaela Morgan; illustrated by Moira Kemp (Carolrhoda, 1994). The Bigness Contest by Florence Parry Heide; illustrated by Victoria Chess (Little, Brown & Co., 1994). Dont Call Me Fatso by Barbara Philips (Raintree, 1980). 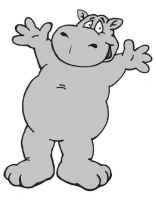 What Should a Hippo Wear? by Jane Sutton (Houghton Mifflin, 1979). A Piece of Cake by Jill Murphy (Putnam, 1989). visit our Radiance Kids Project!